Cahokia Mounds is the most comprehensive example of Pre-Columbian civilizations in the Mississipi region, dating from 900-1600. It can be seen in the form of mounds, used for defense or as tumuli. The area had a pre-urban population of 10.000. Their space was divided in living quarters, rooms for specialized activities (ateliers for manufacturing necklaces have been found) and public ceremonial areas. Earth and wood were used as materials. Cultivated lands were placed outside the borders of the living space. On the rainy day of May, after saw the impressive Eero Saarinen’s Gateway Arch and tried toast ravioli in central St Louis, I drove to Collinsville, Illinois to see the World Heritage Site, Cahokia Mounds. After got out from highway, I entered the archaeological zone. The road signs to Woodhenge and the gigantic Monks Mound were clearly visible along the route, but I decided to visit the museum and interpretive center first in order to get deeper understanding on Cahokia. Despite the rain, the carpark of the museum was surprisingly almost full. Inside the museum, there was a very good replica of ancient village that show how ancient people of Cahokia lived. The story of sun worshipper society was a little Inca-liked to me, but still very interesting to know the existence of Mississippian culture which I have never heard before. The museum was indeed very nice, too bad that my visit happened to be in the same time of school trip, so the place was very noisy and full with children who did their school trip reports. Because of the rain, there were no children allowed to walk outside the museum, so to avoid the crowd I decided to walk along the trail to see the mounds. The walk really reminded me Gyeongju’s Tumuli Park with big and small mounds in the park. The twin mounds were maybe the most interesting one for its bigger size. Along the trail, I could see the Monks Mounds but there was no route from the museum to the great mound, so I backed to my car and drove to the site instead. The Monks Mound was the most impressive sight of Cahokia, the ground size was truly remarkable and larger that the Pyramid of the Sun in Teotihuacan I saw last year. I had to admit that the engineering of ancient Cahokia people was a real world wonder. According to the information in the museum, the Monks Mound was the platform for residence of priests or chieftain palace that carried sun worshipping ceremony. As mentioned by other reviewers, the view on top of Monks Mound was quite nice, even with shower rain, I still could see the view of downtown St Louis. When I walked back to carpark the rain became heavier and heavier, so that I decided to cancel my idea to see Woodhenge and better backed to St Louis. It was a nice two hours visit to Cahokia. The site was very interesting as the Mississippian culture was quite unknown. I surprised to learn the news of financial problem of the site. The problem seems to be that the site located in Illinois, not Missouri. Most of visitors to Cahokia are actually come from Missouri, I talked with the students and their school are in St Louis and there is no fee to visit the place, so Cahokia relies only on budget from Illinois, and the Missourians don’t fully want to provide financial support to help other historical site in other state! It would be a shame that the interpretive center has to close down in certain period of year as without this center to explain, visiting Cahakia will be totally lost in understanding of this site’s outstanding universal value. At last I don’t know why our regular reviewers, Ian Cade and Kyle Magnuson, picked the almost similar photos of Monks Mound but in different season, summer and autumn! Well I decided to continue this nice practice with the similar one but in the rainy late spring version! 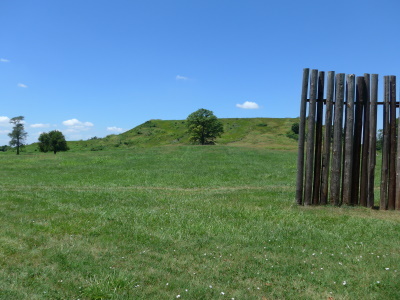 Cahokia is worth a stop for anyone visiting St. Louis. It is a nice side trip from the city. If you are visiting the area solely for the Cahokia Mounds you may be dissapointed. The site is deserving of its place on the world heritage list, the site IS important. 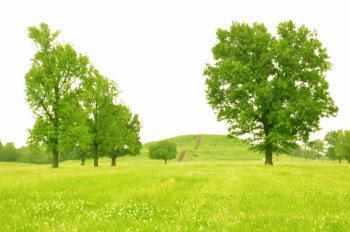 However, as a tourist site Cahokia does not offer much besides mounds that are evidence of a unique civilization. The climb up the stairs to the top of the mound gives little knowledge of the site without being paired with the video in the visitor center. The museum should not be overlooked, it is an excellent source of information about the site, and the video provides a insightful view of what makes Cahokia special. Overall, I enjoyed the experience as I am very interested in Native American history. For me 1.5 hrs was sufficient to enjoy the museum and site itself. On a clear day from the mound top you can see St. Louis in the distance. The site is actually the largest Pre-Colombian city north of Mexico and formerly had a population of around 15,000, the main aspect of the park are the 69 man made mounds, the largest of which is the Monks Mound (pictured) which is around 100ft tall. This is the most impressive part of the site and from the top you get a good over view of most of the site, and you can see central St. Louis. The rest of the site is spread around and basically consists of a lot of grass mounds that vary in size and a ‘woodhenge’ calendar, if I am being honest it was not hugely impressive to see but it was very interesting none the less. The interpretive centre has some interesting exhibits and a recreation of the houses that would have stood in the city, also there was an extremely good video which gives a great introduction, and talks about how and why the civilisation evolved in this area, it made me think of the things I read about evolution of civilisation in Mesopotamia at the University of Chicago the day before. The reasons for the development of a city here were similar as were the structures which were a little like basic Ziggurats. The interpretive centre is closed on Mon-Tue but the park is open all the time. This site is just outside St. Louis and I managed to see it on a long day trip down from Chicago. If you are here it is worth going in to St Louis and the road takes you over the Mississippi on or next to the Eads Bridge which is on the US’s prospective list. Also there is the Eero Saarinen’s Gateway Arch, well worth a visit and the Anheuser-Busch Budweiser Brewery, which is nice, shame about the beer though! 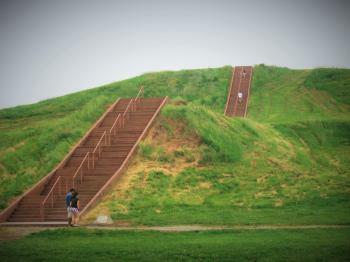 Cahokia Mounds is located just east of St. Louis, MO. This was the last of the USA world heritage sites that I visited. The natural site was very interesting. 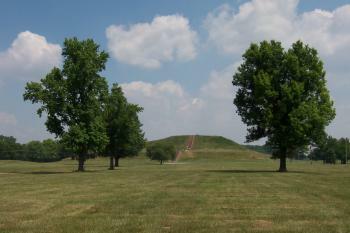 Some of the mounds are more than 100 ft. tall. The site contains at least 70 mounds that are between 800 and 1000 years old. The entire site (a large residential city of the Mississippean Native Americans) was almost completely surrounded by a very impressive fortress. The museum at the mound site is quite good. It has actual artifacts unearthed at the site as well as representations of the city. Several grave sites have been excavated here. One, a high ranking man, was wrapped in a cloak covered with more than 10,000 round shells sewn into the shape of an eagle. Passage of the Sun: "The most spectacular sunrise occurs at the equinoxes, when the sun rises due east. The post marking these sunrises aligns with the front of Monks Mound, where the leader resided, and it looks as though Monks Mound gives birth to the sun"
Free entrance: Entrance is free of charge, although a donation of $4 for adults $2 for children, and $10 for families is suggested. 79 Community Members have visited.